Patricia Anne "Pattie" Weston (née Boyd) (born 17 March 1944, age 74) is an English model and photographer. She was one of the leading international models during the 1960s and, with Jean Shrimpton, epitomized the British female "look" of the era. 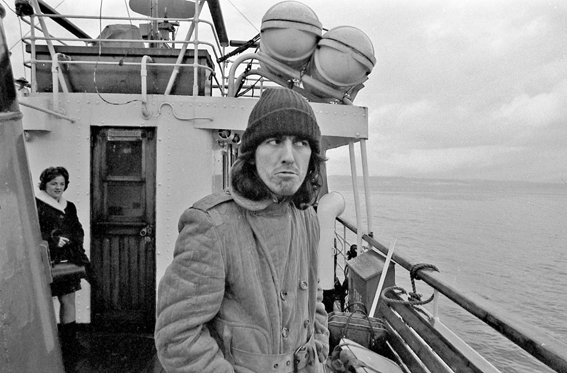 Boyd was married to George Harrison and experienced the height of the Beatles' popularity as well as sharing in their embrace of Indian spirituality. She later married & divorced Harrison's friend, guitarist Eric Clapton. Boyd inspired Harrison's songs such as "If I Needed Someone", "Something" and "For You Blue", and Clapton's "Layla" and "Wonderful Tonight".In August 2007, she published her autobiography Wonderful Tonight. Her photographs of Harrison and Clapton, titled Through the Eye of a Muse, have been exhibited in Dublin, Sydney, Toronto, Moscow, London and throughout the United States. Boyd was born on 17 March 1944, in Taunton, Somerset, and was the first child to Colin Ian Langdon Boyd, and Diana Frances Boyd (née Drysdale), who were married on 14 September 1942. The Boyd’s moved to West Lothian, Scotland, where her brother Colin was born in 1946. The Boyd family moved to Guildford, Surrey, where her sister, Jenny Boyd was born in 1947. Boyd's youngest sister, Paula, was born at Nakuru hospital, Kenya, in 1951. The Boyd lived in Nairobi, Kenya, from 1948 to 1953, after her father's discharge from the Royal Air Force. Boyd's parents divorced in 1952, and her mother married Robert Gaymer-Jones in February 1953, in Tanganyika (now Tanzania). The family returned to England where Boyd gained two half brothers, David J.B. (b. 1954) and Robert, Jr. (b. 1955). Boyd attended Hazeldean School in Putney, the St Agnes and St Michael Convent Boarding School in East Grinstead, and St Martha's Convent in Hadley Wood, Hertfordshire (where she received three GCE O level passes in 1961). Boyd moved to London in 1962 and worked as a shampoo girl at Elizabeth Arden's salon, until a client who worked for a fashion magazine inspired her to begin work as a model. Boyd began her fashion career in 1962, modelling in London, New York and Paris. She was photographed by David Bailey and Terence Donovan, and appeared on the cover of Vogue. Boyd appeared on the cover of the UK and Italian editions of Vogue magazine in 1969, with other popular models of the day, such as Twiggy, who based her early modelling appearance on Boyd. Boyd was asked by Gloria Stavers to write a column for 16 Magazine, and appeared in a TV commercial promoting Smith's crisps. She was cast for A Hard Day's Night, where she met George Harrison.